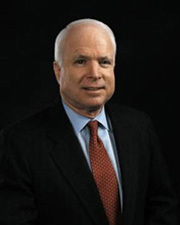 McCAIN, John Sidney, III, a Senator and a Representative from Arizona; born in Panama Canal Zone, August 29, 1936; attended schools in Alexandria, Va.; graduated, United States Naval Academy, Annapolis, Md. 1958, and the National War College, Washington, D.C. 1973; pilot, United States Navy 1958-1981, prisoner of war in Vietnam 1967-1973; received numerous awards, including the Silver Star, Legion of Merit, Purple Heart, and Distinguished Flying Cross; elected as a Republican in 1982 to the Ninety-eighth Congress; reelected to the Ninety-ninth Congress in 1984 and served from January 3, 1983, to January 3, 1987; elected as a Republican to the United States Senate in 1986; reelected in 1992, 1998, 2004, 2010, and 2016, and served from January 3, 1987, until his death; chair, Committee on Indian Affairs (One Hundred Fourth Congress; One Hundred Ninth Congress), Committee on Commerce, Science, and Transportation (One Hundred Fifth through One Hundred Sixth Congresses, One Hundred Seventh Congress [January 20, 2001-June 6, 2001], One Hundred Eighth Congress), Committee on Armed Services (One Hundred Fourteenth and One Hundred Fifteenth Congresses); was an unsuccessful candidate for the Republican presidential nomination in 2000; was an unsuccessful Republican nominee for President of the United States in 2008; died in Cornville, Ariz., on August 25, 2018; lay in state in the Rotunda of the U.S. Capitol, August 31, 2018; interment in the United States Naval Academy Cemetery, Annapolis, Md. McCain, John, with Mark Salter. Character is Destiny: Inspiring Stories Every Young Person Should Know and Every Adult Should Remember. New York: Random House, 2005. ___, with Mark Salter. Faith of My Fathers. New York: Random House, 1999. ___, with Mark Salter. Hard Call: Great Decisions and the Extraordinary People Who Made Them. New York: Twelve Books, 2007. ___, with Mark Salter, The Restless Wave: Good Times, Just Causes, Great Fights, and Other Appreciations. New York: Simon & Schuster, 2018. ___, with Mark Salter. Why Courage Matters: The Way to a Braver Life. New York: Random House, 2004. ___, with Mark Salter. Worth the Fighting For: A Memoir. New York: Random House, 2002.